The chamber of the 36-seat state Senate. It’s Election Day in Connecticut. 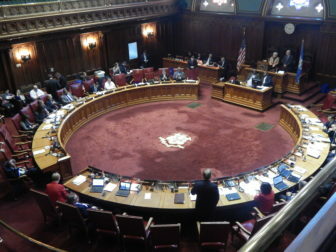 As voters go to the polls, the battle for control of the Connecticut Senate, which has heated up in the final weeks of the campaign, is crucial to shaping state government for the next two years. Republicans need to pick up four seats to win a 19-17 majority, which would be the GOP’s first since 1994. With nine battleground races on the map – six held by Democrats, three by Republicans – the path is narrow, but possible. In August, the Mirror profiled the nine contests expected to be competitive, and on Monday rounded up the latest headlines from each. Now here is an overview of what to watch for in each of the competitive races as the results come in tonight. What to watch: Republicans have come close to beating Steve Cassano twice – in 2010 and 2014 – and did so by winning the district’s three rural towns. However, Cassano, the former mayor of Manchester, has been able to counter with sizable margins of victory in his hometown each time. He won 59 percent there in 2014. Even if Lorraine Marchetti is able to grow her margins outside of Manchester beyond those of past candidates, she has to narrow Cassano’s margin in Manchester if she is going to win the district. What to watch: The 2012 and 2014 races between Danté Bartolomeo and Len Suzio were tight across all four towns in the district. While Suzio won Cheshire and Middlefield in the last two contests, Bartolomeo took Meriden and the portion of Middletown in the district to offset those victories. Unlike other races, there is no clear barometer in the district, which has been decided by about 250 votes in both of the last two elections. That said, Meriden – the hometown of both candidates – could be crucial. Bartolomeo has held Suzio to 47.5 percent there in the previous two races. If the margin in Meriden tightens any more, it could be enough to tip the seat in Suzio’s favor. What to watch: The Naugatuck Valley is one region of the state that is tough to gauge heading into Election Day. Trump saw particularly strong turnout in the region during the presidential primary. If that enthusiasm carries over to the general election, George Logan stands to gain from it. However, Logan’s most significant challenge will be to improve on past Republican margins in Hamden. While the district only contains a small portion of the town geographically, it has voted overwhelmingly for Joseph Crisco in nearly all of his campaigns. No Republican candidate in the district has reached 40 percent in Hamden since the 1996 election. If Logan surpasses that mark, it could put him in position to win the seat. What to watch: The map is in Heather Somers’ favor heading into Election Day. State Sen. Andrew Maynard, the Democratic incumbent, was able to hold his seat for five terms by keeping Groton out of reach for his Republican challengers. As the former mayor of Groton, Somers might be capable of swinging it back into the Republican column. Timothy Bowles, who comes from the northern end of the district, has to keep Somers from running up the margins along the coastline if he wants to win. What to watch: The seat is a perennial target for Republicans, but tends to be more difficult in presidential election years. President Obama’s campaigns helped to create strong turnout in Bridgeport during both the 2008 and 2012 cycles, which played a major role in keeping the seat out of reach for Republicans. If Clinton is unable to keep turnout at those levels, the district could be more competitive than usual in this presidential cycle. Marilyn Moore is counting on urban turnout in Bridgeport to offset likely victories for Elaine Hammers in Trumbull and Monroe. What to watch: The rematch between Mae Flexer and John French is not guaranteed to be as close as it was when Flexer won by 520 votes two years ago. Turnout among students at the University of Connecticut is typically higher in presidential election years. The question this year is: How much higher will it be? It is unclear whether student enthusiasm is as high as it was during Obama’s campaigns. Regardless, French still needs to gain ground elsewhere in the district. His hometown, Windham, has the highest potential for improvement. If French can trim the 12 percent deficit he had there two years ago, he has a shot. What to watch: Northwestern Connecticut was one of Trump’s weakest regions in the state’s April presidential primary. If Republican turnout in the district is lower than usual on Election Day, it could hurt Craig Miner’s chances of winning a seat that has been in Republican hands for three decades. One of the reasons retiring Republican Sen. Clark Chapin won his reelection bids with relative ease was that he kept his hometown of New Milford out of play. David Lawson, a New Milford native, is in a strong position to change that. Lawson’s margin there could be indicative of whether he will carry the rest of the district on election night. What to watch: While Republicans have held the 31st District for the past three cycles, none of the wins could be characterized as comfortable. In his first race two years ago, Henri Martin, a then-Bristol City Council member, flipped his hometown to the Republican column and kept the seat red as a result. However, two years ago, his challenger was not from Bristol. This time around, he faces Michael Nicastro, whose brother Frank has spent three decades holding political offices in the city. If Nicastro swings Bristol back to the Democrats by a significant margin, he could very well do the same with the seat. What to watch: Art Linares cruised to reelection two years ago, but his first race for the seat was much closer. A once-safe Democratic stronghold, this district in the lower Connecticut River Valley elected Linares with just 48 percent of the vote in 2012. His victory was made possible, in part, by a Green Party candidate who received 9 percent of the vote. But Linares’ win in 2014, which came without a strong third-party challenger, was a near-clean sweep of the district’s towns. Norm Needleman not only needs to win Essex – his hometown – by a convincing margin, he needs to swing back other traditionally Democratic towns as well. The race’s wild card, Green Party candidate Colin Bennett, could keep Needleman from accomplishing that task in what is shaping up to be an atypically strong year for third parties.